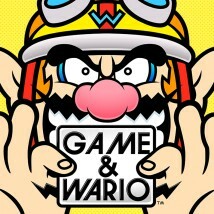 Can you each tell me which of the 16 games on Game & Wario is your personal favourite? Yes, I’d have to say ‘GAMER’ too. Well, it’s just a really scary game. ...It’s scary? But surely WarioWare titles should be zany and have you in fits of laugher as you play them! How is it scary? In ‘GAMER’, the player uses the Wii U GamePad to play a series of WarioWare microgames while you can see your bedroom on the TV screen. Your mother is patrolling outside your room, and if it looks like she’s about to rumble you, you have to stop playing the game and pretend to be asleep. You know when you’re driving your car and you have a near-miss on the road, there’s that moment when your whole body shudders. When it looks like your mother is about to catch you, you have that exact same feeling! No, she’s right. That’s exactly how scary it is. But it isn’t like a horror game where the fear comes from the use of terrifying images. Yes, in some senses, fear and laughter are two sides of the same coin, and when you take either to the extreme, they become more or less indistinguishable. That’s just what I feel we achieved with this game. 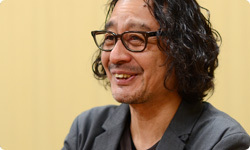 I wasn’t sitting near to Sakamoto-san, but other members of staff who were close to him managed to listen in to him speaking about the game, and he said something like: “This is what I’ve always wanted to achieve, and they’ve gone and done it!” When I heard that, I was really thrilled. 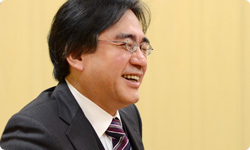 Abe-san, you use Sakamoto-san as a kind of sensor who can tell whether a game is good or bad, so that must have been particularly pleasing for you. I really feel that it’s a ground-breaking game, and about eighty or ninety percent of the energy that I put into Game & Wario was focused on ‘GAMER’. I would be saying things like: “If we get this right, it will really break new ground! We can’t afford to compromise on this one!” “When we unveil it to the world, this game has to be as good as it can possibly be!” is the point that I simply could not compromise on. Or, at least, it’s what I asked Abe-san to do. That’s why I really want people to get the opportunity to play this game. Well, I’d like them to play it right away, but you can’t actually play it right from the start, can you? Well, if you play the game for a while, you’ll be able to access it. I really think it’s a great game, and it is really scary. You’re in for a real surprise! I think so! (laughs) Now, which other games do you recommend? For me, it’s ‘PIRATES’. There’s a pirate ship in the middle of the screen, and there are arrows flying from it what you need to block with the GamePad. Our initial aim was to try to come up with a game that really made you feel that objects were flying at you from the TV. This is a game that’s only made possible by the GamePad, isn’t it? One thing we had to bear in mind was that players will have televisions of different sizes, and they will be holding the Wii U GamePad at different distances from the screen. We made it so there was a rhythm to the timing with which the arrows flew out of the screen. We didn’t make the game all that difficult, and we made it so that it actually feels really enjoyable to play once you get into the music’s rhythm and start moving your body in sync with it. With ‘PIRATES’, we’ve captured that feeling of being at a video game arcade, where you need lots of space and large game machine in order to play, but we’ve allowed you to enjoy it in the comfort of your own home. I really like ‘SKI’. For someone like me, who comes from the Famicom18 generation, it’s great to have a game that has very simple controls but at which you get better and better as you play it more. That’s why I’d recommend that you give ‘SKI’ a go. You control the game using quite basic movement of the Wii U GamePad, but the graphics on screen are really rich and detailed – in a really unnecessary way, in fact. But that makes it great fun! (laughs)18. Famicom: Also known as the Family Computer System, which is the Japanese name for the Nintendo Entertainment System. The Famicom was released in Japan in 1983. Well, I think it’s a rather strange game, if I may put it like that, in the sense that the images the player sees on the Wii U GamePad are really quite poor, while the graphics that everyone else can see on the television screen are really good. Yes, that was what we were going for. Video: Skiing with an audience! I improve so drastically that it’s actually a little unnerving! Hmmm... What could it be? (laughs) Well, whatever it is, as soon as those girls appear on the slopes, I really feel like a great skier. I can usually get all nine girls to follow me on the slopes. I really can’t tell you how much I enjoy that!